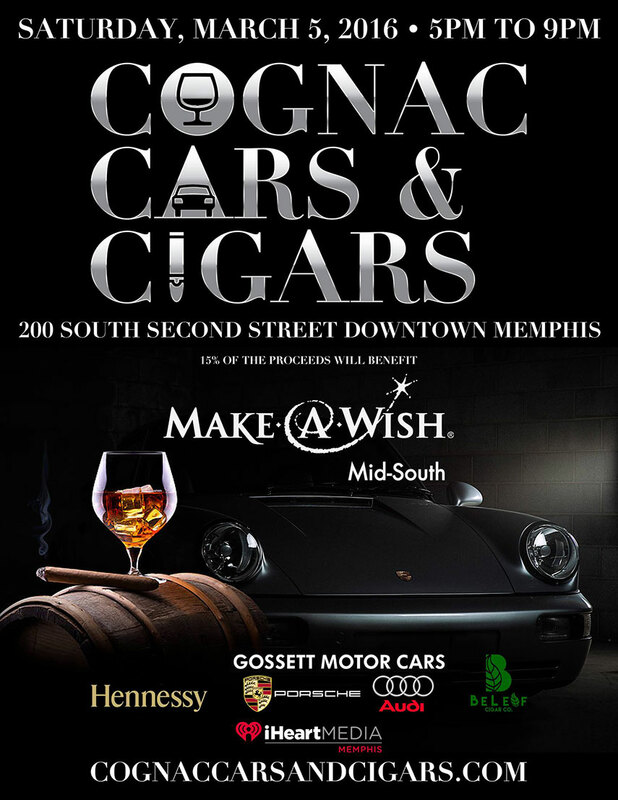 Cognac, Cars & Cigars is an all inclusive cigar and cognac tasting event with a one price admission to benefit Make-A-Wish Midsouth. Attendees can relax with Cognac from Hennessy and a premium cigar from BeLeaf Cigars while admiring some of the hottest cars on the market from Gossett Porsche and Audi, as well as personal cars from NBA players. Take a break from everything and enjoy live music from local performers and cuisine from local restaurants. The inaugural event will be held at 200 S. 2nd Street garage rooftop, the perfect place with breathtaking views overlooking downtown Memphis. TICKETS: $100 includes all beverage samples, a souvenir glass, a premium cigar, food samples, and 15% net tickets to benefit Make-A-Wish Midsouth. Join them Saturday, March 5th, 2016 from 5-9PM at the LAZ Parking Garage Rooftop in Memphis, Tennessee for the Inaugural Cognac, Cars & Cigars.